There are some Underground stations that look better in the dark. Not that they aren’t attractive or intriguing when seen in daylight. Rather their qualities take on added appeal when the sun has set and electric lights are switched on. 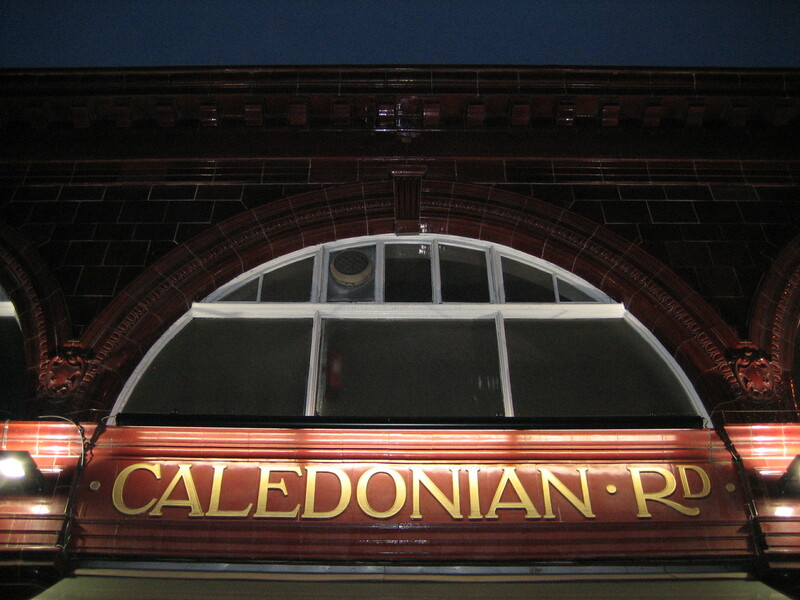 Caledonian Road is just such a station. It’s the first one I’ve mentioned on this blog to have been designed by Leslie Green, architect of well over two dozen Underground buildings, all built in the first decade of the 20th century, and all bearing certain signature elements: two storeys, semi-circular windows, patterned tiles on the inside, and hundreds upon hundreds of ox-blood red glazed terracotta blocks on the outside. Now before I go any further, I should admit that I’m not an especially huge admirer of Leslie Green. I know that he is held in very high regard by some – the writer Mark Mason, for instance, who makes his fondness for Green’s stations very clear in his book Walk the Lines, where he ranks the man far above Charles Holden, the only other architect in history to have exerted an influence over the Underground on a similar scale. But I beg to differ. I am very firmly in the Holden camp. Green’s work is well-executed, to be sure. But it can also tend towards the… how can I put this? Dull. Lumpen. At times, even a bit boring. The problem lies, I think, with those ubiquitous ox-blood blocks. I simply don’t find them particularly inspiring. There are just too many of them – not in the context of any one of Green’s slew of stations, but when taken as a whole, right across London. Where is the variety, the flair? Where are the distinguishing features that give each of Green’s buildings their own individual personality, as well as that collective identification of belonging to the Underground? Where, in short, is the imagination? I concede that an understanding of uniformity inspired Holden as well. But Holden did not end up churning out precisely the same look and feel for every single one of his stations. Just journey a bit further up the Piccadilly line from Caledonian Road to see evidence of that. Green, by contrast, seemed to opt for a uniformity of appearance rather than style. Tragically, the pressure of producing so many of these identikit stations in such a short space of time killed him. Green was given the job in 1903; five years later he was dead. 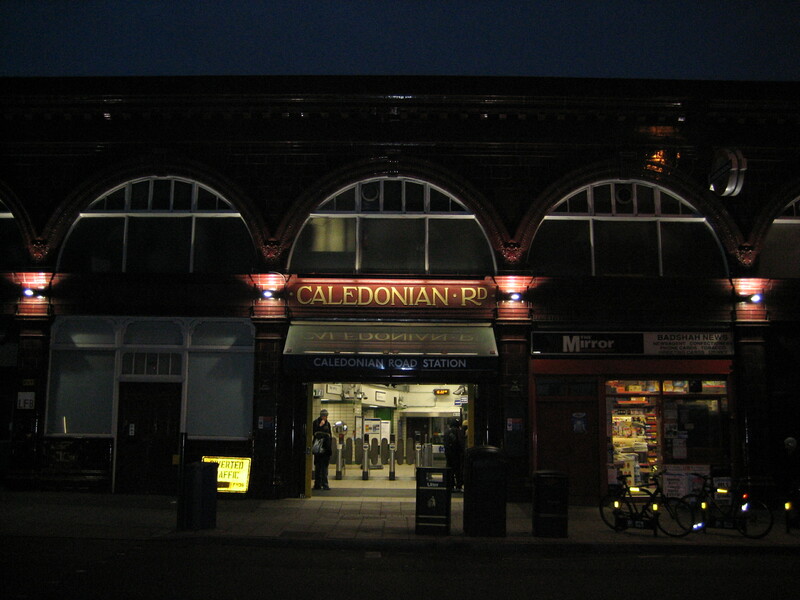 Caledonian Road, when seen in daylight, is no better and no worse than any of Green’s other surviving efforts. But come nightfall, it becomes a little bit different. And that’s why I like it. The lights are switched on and the exterior, especially the entrance, immediately assumes a bit of character it didn’t have before. It gains a personality all of its own. All the familiar motifs of Green’s work suddenly look slightly enhanced, enriched – even a bit magical. There’s a predictability about Leslie Green’s squat, homogenised stations that, while appealing to some, can’t help but feel disappointing to others. A single innovation of art or design is laudable enough, but the same innovation, repeated more or less identically within a concentrated period of time or geographical space, dilutes not just the quality of one but of of all. Green’s work is plentiful and enduring, a bit like London’s theatres. But at the end of the day – literally, in the case of Caledonian Road – both types of venue need a few special effects to come into their own.